We Ship Worldwide. All Orders Are Shipped Within 24 Hours! International Orders: Locate the shipping calculator (at the bottom of the shopping cart) and select your country, zip code and state. Because of this extreme variance the shopping cart does not calculate the shipping charges for countries outside USA and its default is $0.00. Paid by credit card: when your order is received and packed, we will e-mail you the shipping cost which is based on the weight and the country where you live. A shipping charge will be added to your order upon your approval. If you prefer to pay with PayPal, we will e-mail you the invoice for shipping cost upon your approval. (confirmed through PayPal). 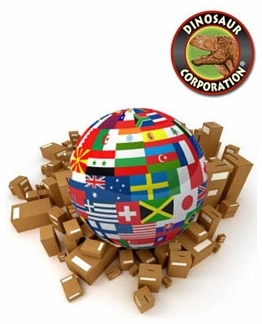 You can also contact us for the shipping quote at Dinosaur Corporation Our customer service will reply within 24 hours. Express International 3-5 business days. USPS Priority to Canada: 5-6 business days (in the Shopping cart under "Shopping Calculator" select USPS Priority to Canada to see the shipping cost). The minimum international order is $30. All orders are shipped from United States by International Postal Service www.usps.com. The tracking number is emailed with every order. If you need assistance tracking your package, please contact us by e-mail at: Dinosaur Corporation or by phone 360-835-2228. (Before calling, please see the International Calling Code for your country). Example calling from Canada is 1 360-835-2228, calling from Europe 001 360-835-2228 etc.